Medistar Corporation announced today that it closed on financing and began construction on the new InterContinental® Houston Medical Center hotel and Latitude Med Center luxury apartment tower located at the intersection of Main Street and Old Main Street in Houston, Texas. Construction has started on new InterContinental(R) Houston Medical Center hotel and Greystar Latitude Med Center luxury apartment tower in Houston, Texas, adjacent to the world's largest medical complex. The site is immediately adjacent to the Texas Medical Center, the largest medical complex in the world with 50 million square feet of buildings, on 1,345 acres, supporting 8 million patient visits annually. "The project includes more than 1.1 million square feet of upscale hospitality and residential solutions to meet the growing market demands not only for the Texas Medical Center, which has an increasing number of international travelers familiar with the InterContinental brand, but also the Greater Houston Area," said Kelly Lindig, Vice President at Medistar and lead development officer for the project. Lindig brings both mixed-use development and over 20 years of hotel development experience, comprising $2 billion in project value. Lindig added, "The residential and hospitality aspects of the project are designed to complement each other and will benefit the entire region. 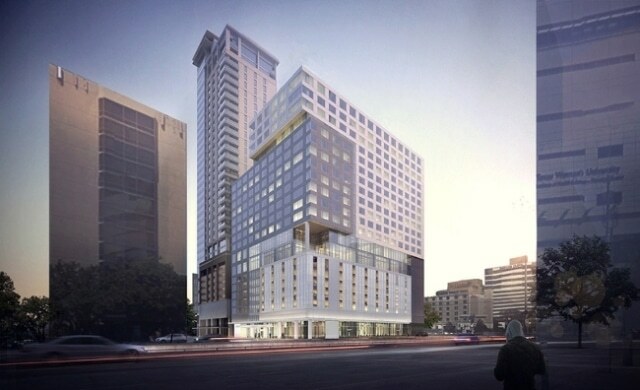 You could say that our 'across the street marketing plan' allows for stability for the hotel because of the proximity to the Texas Medical Center, while also providing a walkable solution for anyone looking for a nearby apartment home. Partnering with Greystar for the second tower makes this project work." InterContinental Houston Medical Center is the first full-service luxury hotel to be developed in the immediate area in several decades and will provide modern four-star accommodations, amenities and guest services for domestic and international travelers. With 21 stories, the hotel features 353 guestrooms and suites and includes 11,800 square feet of meeting space – comprised of seven meeting and board rooms and a 7,800 square foot Grand Ballroom. Monzer Hourani, Founder and CEO of Medistar, said, "InterContinental Houston Medical Center will meet a critical need for guests visiting and doing business with the world-renowned Texas Medical Center and its member institutions. We are proud to partner with IHG to bring this project to life." Scheduled to open in late 2018, InterContinental Houston Medical Center is being developed by Medistar through a joint venture partnership with TRC Capital Partners. The hotel will be owned by Medistar and managed by InterContinental Hotel Group (IHG). TRC Capital Partners, formerly The Redstone Companies, brings extensive high-rise development and hospitality operating experience to the joint venture. Steve Lerner, CEO of TRC Capital, said, "InterContinental Houston Medical Center will be a thoroughly modern, upscale hotel and meeting space for the Texas Medical Center community. We are delighted to partner with Medistar on this landmark project." Joel Eisemann, IHG's Chief Development Officer of the Americas, said, "We are very enthused about working with our partners at Medistar Corporation to bring the InterContinental Hotels & Resorts brand to Houston and the Texas Medical Center, which serves patients and visitors from all around the world. We appreciate Monzer Hourani's vision for and commitment to this outstanding project." InterContinental Houston Medical Center was designed by HOK, is being built by GHJ Construction and is scheduled for completion in late 2018. Medistar selected Greystar, the largest operator of apartments in the United States, as its partner for the 35-story Latitude Med Center luxury apartment tower. "We are excited to be able to offer a new upscale living option this close to the Texas Medical Center," said Bo Chapman, Director of Development for Greystar. "Standing side-by-side on a site barely more than an acre, design of the hotel and apartment towers forced meticulous coordination between the development teams, often playing to each other's strengths to find solutions to unique challenges." Latitude Med Center will offer a variety of one, two and three-bedroom floor plans as well as penthouses, ranging in size from 349 to 3767 square feet of living space. From well-appointed interiors with modern living spaces to amenities that include a rooftop infinity pool, separate 10th floor amenity deck and concierge services, the community will meet the needs of any lifestyle. Designed by The Preston Partnership, Latitude Med Center is being built by Hoar Construction and scheduled for completion in late 2018.